Well, it’s that time of year again when my refrigerator is bursting with apples because we’ve made not one, not two, but THREE trips to various apple orchards, and yet without fail each trip ends with the boyfriend insisting on picking “just a few more!” To be fair, though, he’s in the kitchen preparing an apple coffee cake as I write, so I can’t say that he’s not doing his part to help use them up. 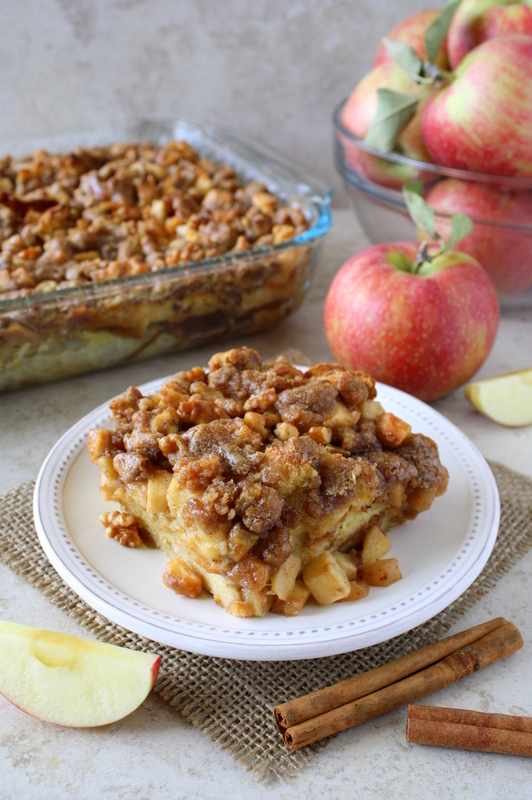 For my part, I whipped up this apple pie French toast casserole! 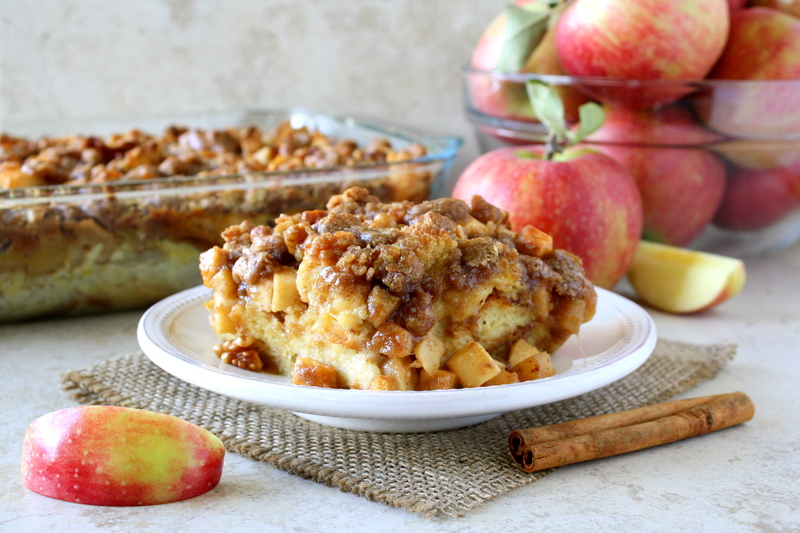 After falling head over heels in love with the cherry pie French toast casserole I created in February, I immediately started brainstorming ideas for other flavor variations, but I decided to hold off on this one until fall, when I knew we’d be up to our eyeballs in freshly picked apples. Have you ever waited a really long time for something and in the meantime built it up in your head to such a degree that the actual thing turned out to be a bit disappointment? I definitely have, but trust me, this was NOT one of those times. 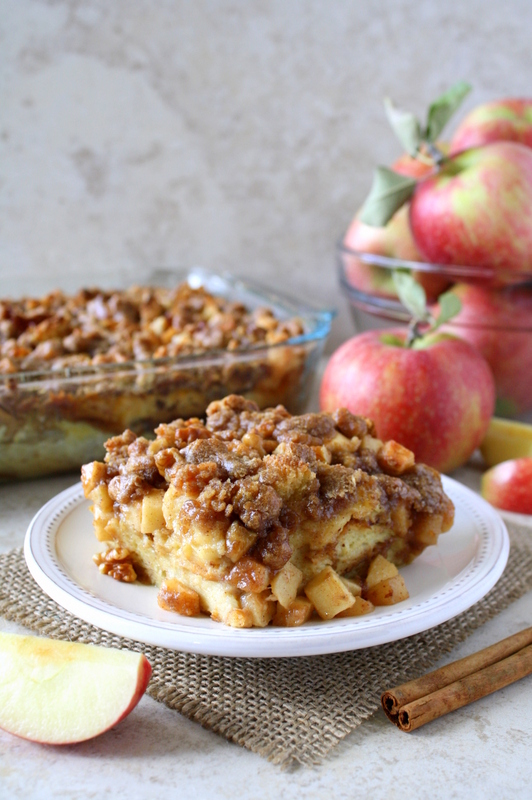 This apple pie French toast casserole will impress you and your fellow brunch-goers with your very first bite…if not sooner! Its cozy, cinnamon-filled aroma is so inviting that you may find it hard not to yank the pan from the oven a few minutes early. But as amazing as it smells, it tastes even more amazing: how can you go wrong with tender, sweet challah cascading with juicy apple chunks and topped with a crispy, crumbly walnut streusel? Answer: you can’t! One loaf of challah makes a full 9×13 casserole, so this recipe is perfect if you’ve got a group (~6-8 people), but it also keeps quite well in the fridge for several days if you have leftovers—just warm ’em up for a minute in the microwave and you’ll be good to go. 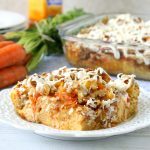 This casserole is easier to make than a pie or a ton of individual slices of French toast, so it’s a win-win: you get the flavor and comfort of both but with just a fraction of the effort! How has fall been treating you? Ours here in southeastern Michigan has been unusually warm for the most part, but that certainly hasn’t stopped us from going about our customary fall activities, like apple-picking and doughnut-eating. What are your favorite fall traditions? Combine all the ingredients for the filling and place in a non-stick skillet. Cook over medium-low heat until the apples are softened (but not mushy), about 4-5 minutes (see notes). Spoon dollops of the apple pie filling in between and on top of the bread chunks. In a separate bowl, mix together the flour, brown sugar, cinnamon, and salt. Add the butter and work it into the dry ingredients until the largest pieces are no bigger than the size of peas. Stir in the chopped walnuts and sprinkle the mixture on top of the bread chunks. The amount of sugar (both granulated and brown) for the apple pie filling will vary somewhat depending on the type of apples you use. I used Jonagolds for this recipe, which are considered sweet-tart apples. If you use a tart variety like Granny Smith, you will probably want to add more sugar than the recipe specifies. The time it takes for the apples to soften may also vary somewhat depending on the type; for instance, it may take more than 4-5 minutes for harder varieties such as Granny Smiths. I would not recommend using this filling recipe in an actual apple pie, as there is no thickening agent. 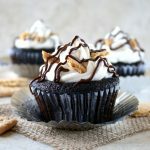 I’m sharing this post at the following link parties: Recipe of the Week, The Wednesday Showcase, Welcome Home Wednesdays, Foodie FriDIY, and Fiesta Friday. Yes, exactly…this hits the spot when you’re craving something special. I haven’t jumped into piles of leaves since I was a kid, but that sounds like fun! Fabulous! This would be so great for company! Yes, definitely! I don’t have visitors often, but when I do, it’s French toast casserole time! I can help take some of those apples off your hands! 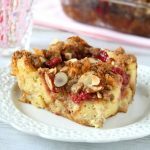 😀 Loving this no-fuss French toast casserole. I can only imagine how good it makes the house smell and so inviting for brunch guests. YUM!!! Mara this looks unbelievably delicious and decadent. Holy cow! 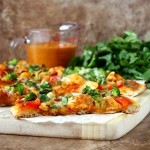 Love this recipe, Mara! 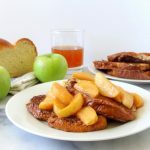 French toast is my absolute favorite breakfast food, and jazzing it up for fall and to feed a crowd is perfect. 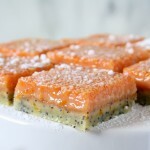 Definitely bookmarking this recipe to feed my holiday houseguests! Wow, this sounds AMAZING! Definitely the perfect Fall breakfast. Mara – I need this in my life! Pinned! I think we all do! Let me know how it goes if you try it! This looks so yummy and perfect for a brunch I’m hosting next weekend. Do you think it could be prepared the night before and baked in the morning? I’m in heaven! My two favorites in one dish! Sounds like this is perfect for you! Let me know what you think if you try it! This looks like the perfect Saturday morning breakfast treat! YUM! Absolutely! It’s a great way to kick off a relaxing and leisurely weekend. This sounds so good!! Perfect for a breakfast/brunch potluck we sometimes have at our school. I’ll bring this next time! Thanks, Mara! 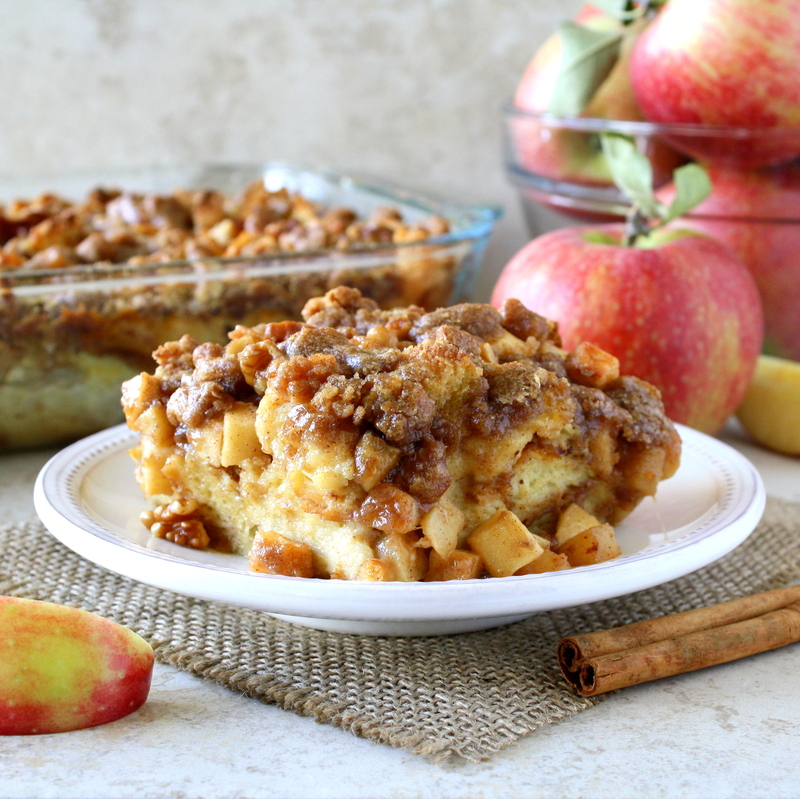 This sounds like a perfect way to use up apples 🙂 And to have french toast casserole. Admittedly the French Toast Casserole was the way to my heart. 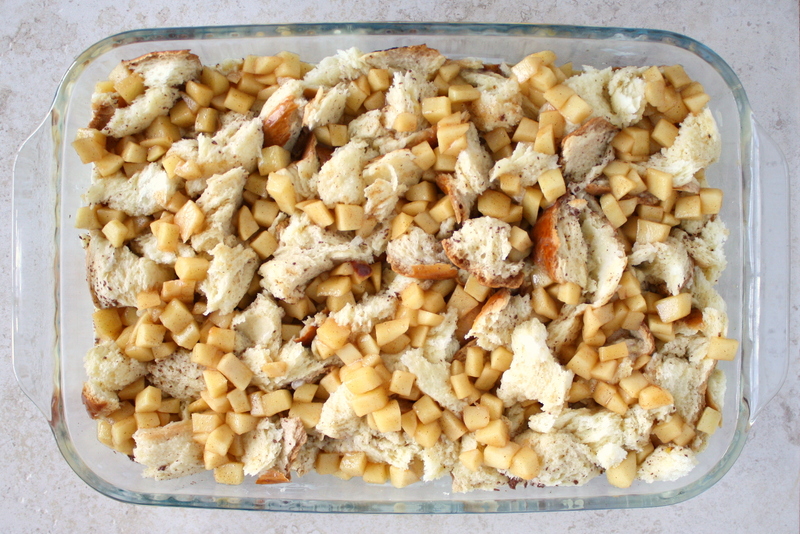 French toast casserole is the way to my heart as well…it’s like a big hug in casserole form! Thanks for stopping by and for hosting this week! I love apples, and french toast. Sounds like a winner! It’s definitely a winner in my book! Thanks for stopping by, Matt! Oh heavens Mara this casserole looks amazing! Thanks, Julie! I hope you’re having a great weekend. Yep! That has me wanting a piece immediately! You and me both! Thanks, Michelle! Thanks so much, Mollie! I bet if you try it, you’ll be a lot in love with it! 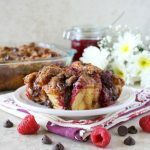 I make something similar using Great Harvest cinnamon bread and it is always a hit. Your version looks delicious too. Happy FF! Oh that sounds delightful! I’ll have to try switching up the bread I use as the base. Thanks for stopping by and for hosting this week! It’s hard to not pick just one more apple…or just one more handful! They add up quickly. This french toast looks like a perfect breakfast! 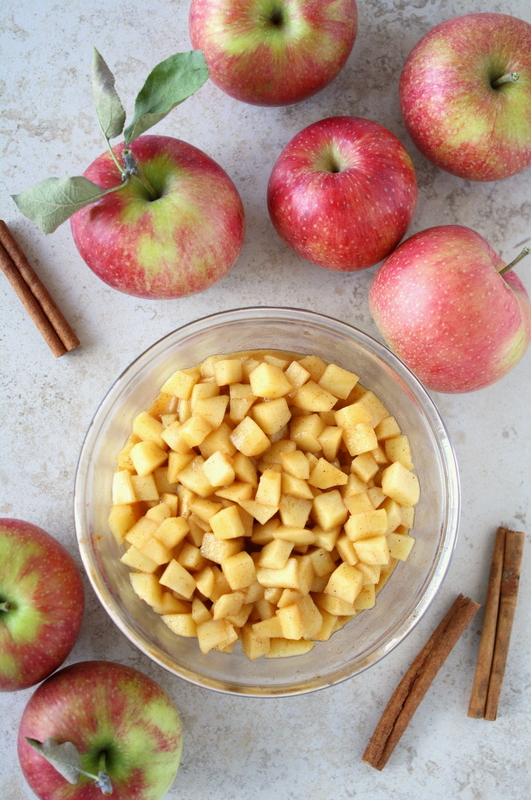 I love fall and apples are part of the love! It really is difficult to stop, especially when the orchard charges by the bag rather than by the pound. I hope you get a chance to try this sometime! Oh gosh, this is just perfect! Such a luxurious breakfast! Luxurious indeed! Thanks for stopping by, Petra! It has quickly become one of our favorites, and I hope it’ll soon become one of yours as well! Thanks, Petra! Better late than never, right?! We certainly picked our money’s worth of apples (that was the easy part) – now we have to make sure none of them go to waste! 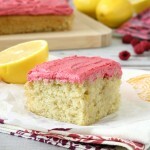 Oh yum – these photos make me realize I MUST make this this weekend. Gorgeous! With houseguests this weekend, I couldn’t wait to make this breakfast casserole. Everyone loved it and agreed that it was worth the wait (my oven wanted to take longer to bake it). One family member even liked it more than the cherry pie filling version. I like BOTH. I’m so glad to hear that you made this! The oven in my current apartment does tend to bake things faster than other ovens I’ve used (I still don’t get how that works). Do you remember how long it took for you? It ended up baking for about an hour.